I spotted this small brush for sale on a French website and had a ‘feeling’ about it, but could not persuade the seller to send a better photo, so I took a punt and paid a mere 6 euros for it - which is less than $7US - plus shipping. 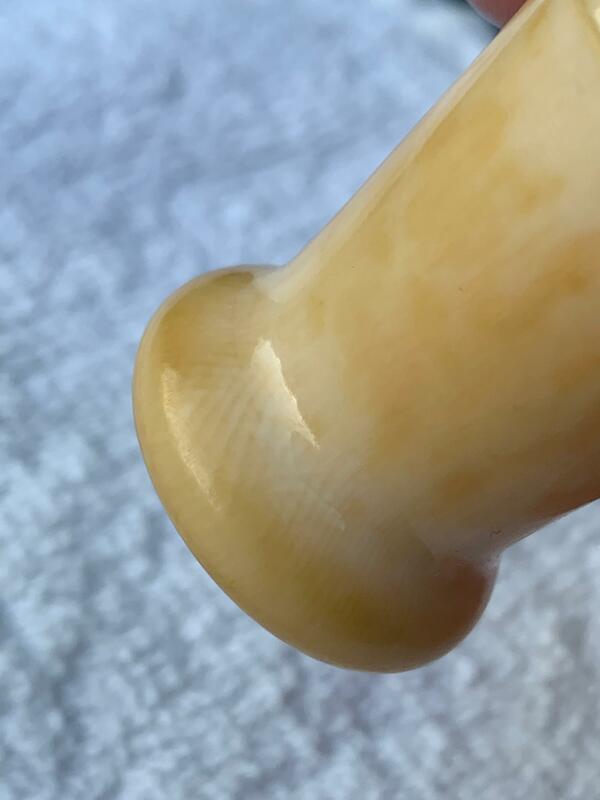 The first picture is what I saw on the site, and the following ones show the brush after I received it (well, the handle, as the knot was irredeemable)...and, turns out, it is ivory. Check the Schreger lines. 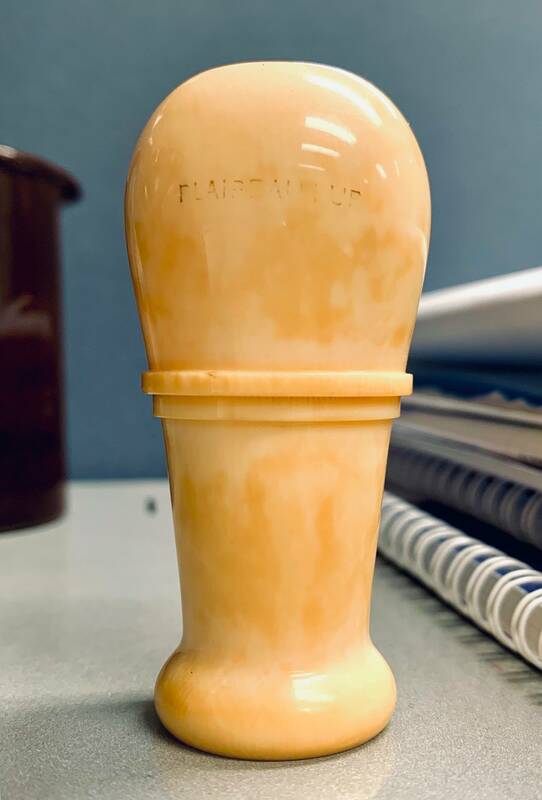 I couldn't really see the lines when the brush came up for sale, but I detected a faint hint of cross-hatching and was only able to see the handle was ivory when I received it. 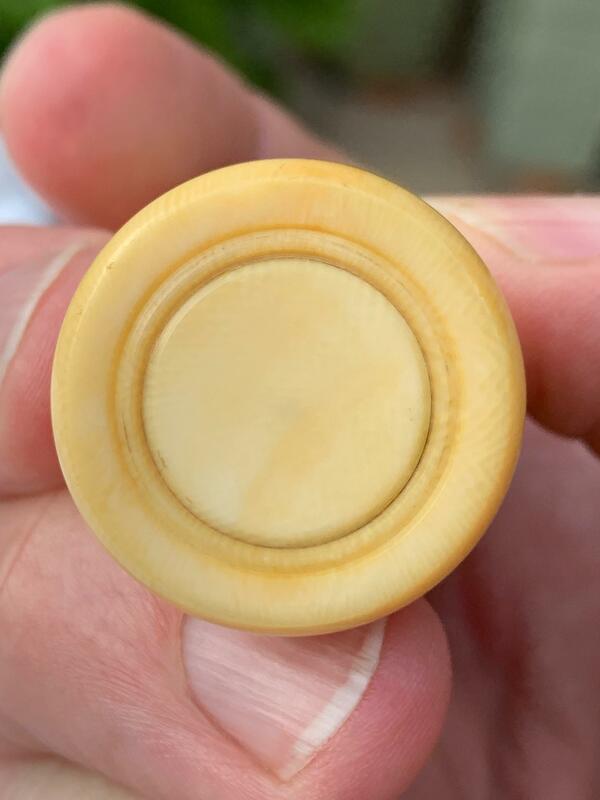 I wasn't seeking ivory, I should point out, and I doubt the seller knew what the material was, either. Just turned out that way. 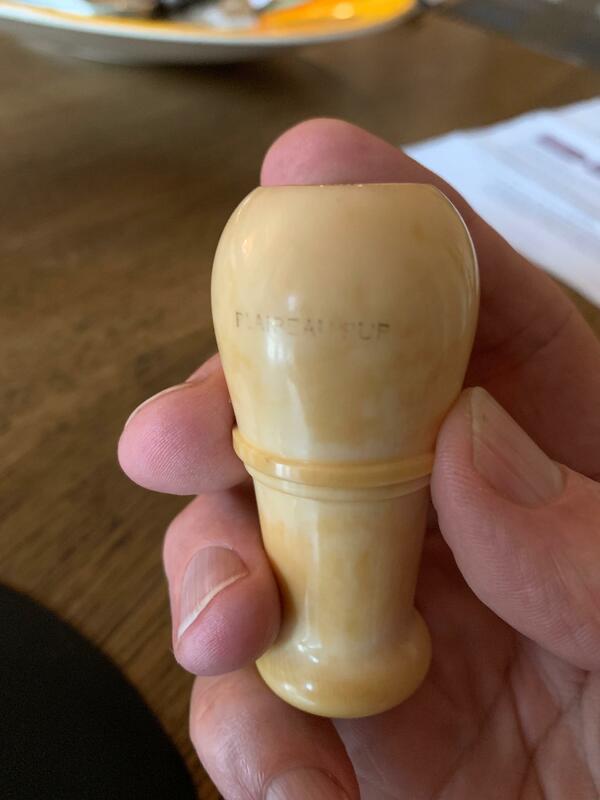 Normally, no, I would not like it if it was modern/recent ivory - killing beautiful elephants concerns me - but my researches indicate this brush dates from somewhere between 1880 and 1910. The handle height is 70mm, and knot hole is 18mm. I'll get it re-knotted...but what might you suggest in terms of a knot, to do justice to this gem? OMG this is real treasure. Beautiful!!! You might want to consider asking Scott (Declaration Grooming) to construct you a bespoke knot for this very special handle. (01-29-2019, 10:12 AM)ARGH Wrote: Beautiful!!! You might want to consider asking Scott (Declaration Grooming) to construct you a bespoke knot for this very special handle. Nice thought, but being based in Australia, I might search out someone more local. Do you think maybe silvertip? Congratulations, Shaun. I had an true pre-ban ivory brush, and it really had a nice unique feel in my hand. I would suggest that you get a knot with a relatively high loft to balance the height of the handle. Congratulations Shaun. 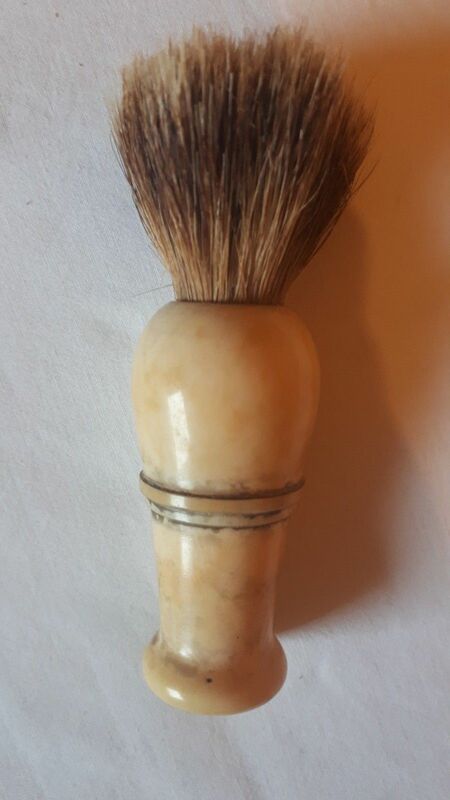 Any pre-ban ivory brush is special. (01-29-2019, 06:39 PM)churchilllafemme Wrote: Congratulations, Shaun. I had an true pre-ban ivory brush, and it really had a nice unique feel in my hand. I would suggest that you get a knot with a relatively high loft to balance the height of the handle. Hi John, yes, my thinking too. The knot hole is exactly 18mm, but am I correct in thinking I need to acquire a 17mm knot? There is a lot of conflicting information out there. I was thinking silvertip, possibly 2-band, with a loft height of 46mm? 50? I also don't know what the implications are of sending the handle to the USA, given confusing laws regarding ivory, etc. Any information would be very welcome, as well as any other comments. I think, were this unique handle in my possession, that I would send it to Bernd at Shavemac and let him apply his skill. He reknotted a handle for me some years ago and I was very pleased. I would be very, very hesitant about sending it to the U.S. 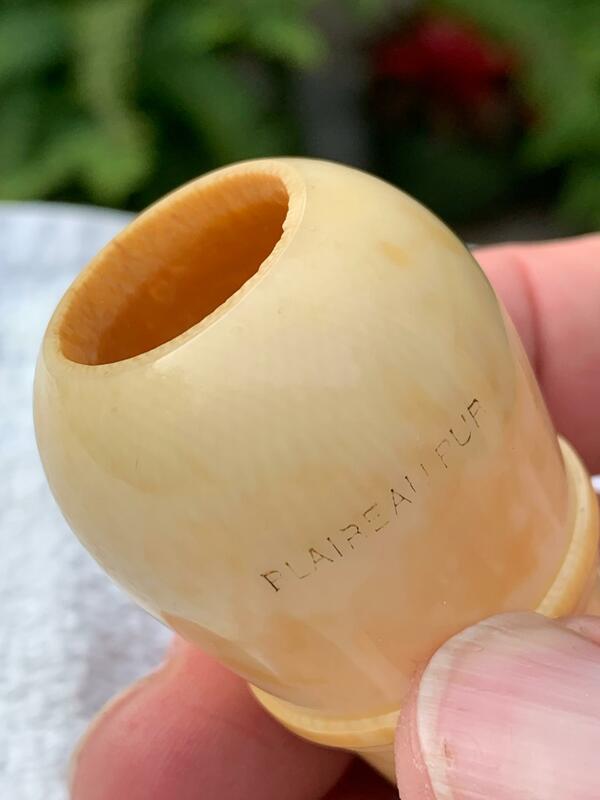 I have heard horror stories of ivory products - even some with well-documented pre-ban provenance - being confiscated by Customs and lost forever. I agree with John's advice about not sending it to the USA. A handle this special deserves being sent to Shavemac or Simpson. It will likely be be a 16-17mm knot, which cost you less than a larger knot. Definitely do not send it across any international borders. (01-29-2019, 08:26 PM)bkatbamna Wrote: Definitely do not send it across any international borders. Ah, well, maybe not the USA. I have to send it somewhere. There is a guy here in Australia does re-knots but doesn’t carry knots and has no experience with ivory. I’m thinking Shavemac at this point. Under brush knot configuration. “The bore of the handle should be 15 mm deep and always 0,5 - 1 mm bigger than the diameter of the shaving brush knot.” I’ve seen the 1mm bigger recommendation before but never the 15mm deep. I had a question I meant to ask Bernd about how his knots are. Say if I got a 23mm Finest bulb with a loft of 53mm, that would mean the total knot would be 68mm? I’m certain that is the answer. I would be very cautious sending it ANYWHERE, outside Australia. I think you should measure, consult with expert, order and glue it yourself. leave your sight/country. Good luck. zipper raises a good point. Shipping it anywhere is a risk. You can send Bernd pictures and whatever measurements he requests. He can do the knot and ship it to you. Installing the knot is easy. And knowing how strict Australian customs are, you might be able to send it but customs may not allow it back due to the hair being an animal product. Thank you everyone for this advice which I have taken up. I won't be sending this rare handle anywhere. I'll contact a knot-maker, get the right specifications, and see if I can glue it in myself. This may take some time to organise, but I'll be sure to keep everyone posted! While I am here just now... I have tried to research the handle type and shape to date it better, but only have a very rough idea.